Fox Footy's Eddie McGuire and Dermott Brereton talk to Tony Armstrong after his debut for the Black and White. Fox Footy's Eddie McGuire and Dermott Brereton talk to Tony Armstrong after his debut for the Black and White. Collingwood intends to select Tony Armstrong in the Rookie Draft on 3 December. 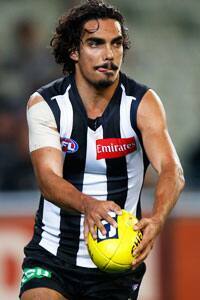 Collingwood has made a final change to its primary list by delisting defender Tony Armstrong. The Collingwood career of the 25 year-old is expected to continue, however, with the club intending to select Armstrong in the December 3 Rookie Draft. After a long wait for his Collingwood debut, Armstrong played the last five matches of the 2014 season. He had previously played a total of 29 matches with Adelaide and Sydney. “In recognition of Tony’s strong finish we have committed to taking him as a mature-age rookie,” Collingwood GM of List Management, Derek Hine, said. The decision enables Collingwood to make up to five selections at the November 27 National Draft, which includes the addition of father-son selection Darcy Moore. Collingwood will take picks No. 5, No. 9 (Moore), No. 30, No. 48 and No. 85 to the Gold Coast, where the 2014 National Draft will be held. Cox is a 211cm ruck prospect from Oklahoma State University in the United States. Crisp is a tall midfielder with 18 senior games to his name. Greenwood ran third in the Kangaroos' best-and-fairest in 2014. Varcoe was a dual premiership player during Geelong's golden era. Armstrong was delisted after 34 senior games (five as a Magpie). Collingwood has signaled its intent to re-select him in the Rookie Draft. Ball retired after 223 senior games. Beams becomes a Lion after 110 games at Collingwood. Clarke returns to Ireland after 73 senior games. Hudson retired after 168 senior games. Lumumba moves to the Demons after 199 senior games. Lynch retired after 227 senior games. Martin retired from AFL football after six senior games and will return to local football. Maxwell retired after 208 senior games. Mooney was delisted after six senior games and will return to Ireland. Yagmoor was delisted after two senior games.